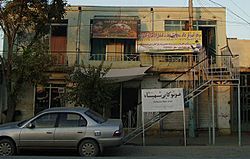 Kunduz (Pashto: کندز; Persian: قندوز) also known as Kundûz, Qonduz, Qondûz, Konduz, Kondûz, Kondoz, or Qhunduz is a city in northern Afghanistan. It is the capital of Kunduz Province. It is linked by highways with Mazari Sharif to the west, Kabul to the south and Tajikistan's border to the north. There are about 250,000 living in the city. Kunduz Facts for Kids. Kiddle Encyclopedia.